Web and new media staff attended the inaugural Web Accessibility Summit last month. The conference focused on website accessibility for professionals in higher education. Universal design considers the needs of a diverse human population. We must consider these needs during every step of the project. From backbone (code) to the voice (content). It’s much easier and less expensive to design for accessibility from the beginning. Poor heading structure and lack of video captioning trigger the most user complaints. Alt text reminder: Context matters. Ask yourself why the image is on the page. You’ll write better alt text that way. An OCR (Office for Civil Rights) complaint is not a lawsuit; it’s an opportunity to resolve a complaint. Open communication between legal counsel and the OCR is key. Users can request accessible document alternatives. We have five business days to provide one. We should remove old/outdated, inaccessible documents from the web. We actually risk more complaints and legal issues by keeping them on your site. Crafting strong content is as much a vital part of good accessibility as anything else. The W3C WAI-ARIA Authoring Practices document offers examples for creating accessible widgets. Be closeable via a button and the escape key. The mission of higher education and accessibility are hand-in-hand. We are making education and information usable for all people. Being passionate about one is being passionate about the other. The Web Accessibility Summit schedule links to the session slides. 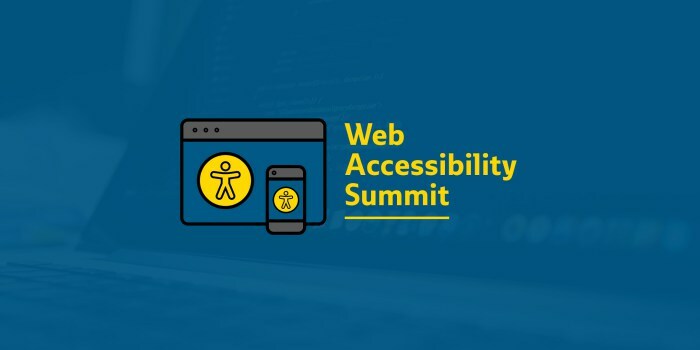 Join us for the first Web Accessibility Summit, a conference about all things website accessibility for professionals in higher education and beyond. When: May 30, 8 a.m.-5 p.m. Seating is limited. On-campus lodging is available. The event is organized by several Missouri higher education institutions.